Salt stress is a major environmental factor which adversely affects the crop yield and quality. However, adequate regulation of mineral nutrients may ameliorate the deleterious effects of salts and help to sustain crop productivity under salt stress. Salt-sensitive (SPF 213) and salt-tolerant (HSF 240) sugarcane genotypes were grown in gravel at 0 and 100 mM NaCl by supplying 0, 1.4 mM, 2.1 mM and 2.8 mM of Si as calcium silicate. Results revealed that plants treated with NaCl alone showed a significant (P ≤ 0.05) reduction in dry matter production, K+ concentration, cane yield and juice quality in both genotypes but the magnitude of reduction was relatively more in salt-sensitive genotype than salt-tolerant. 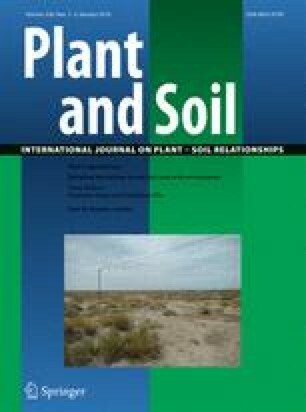 Addition of Si significantly (P ≤ 0.05) reduced the uptake and translocation of Na+ but increased K+ concentrations particularly in shoots of both sugarcane genotypes. Cane yield and yield attributes were significantly (P ≤ 0.05) higher where Si was added. Juice quality characteristics were significantly (P ≤ 0.05) improved in salt-sensitive and salt-tolerant sugarcane genotypes with the application of Si. The results suggested that added Si interacted with Na+, reduced its uptake and transport to shoots and consequently improved cane yield and juice quality in salt-sensitive and salt-tolerant sugarcane genotypes under salt stress. Responsible Editor: Yong Chao Liang. This research is financially supported by Higher Education Commission of Pakistan through Indigenous Ph.D. Scholarship Scheme. The authors are grateful to Director, Sugarcane Research Institute, Ayub Agricultural Research Institute, Faisalabad, Pakistan for providing seed of sugarcane genotypes.